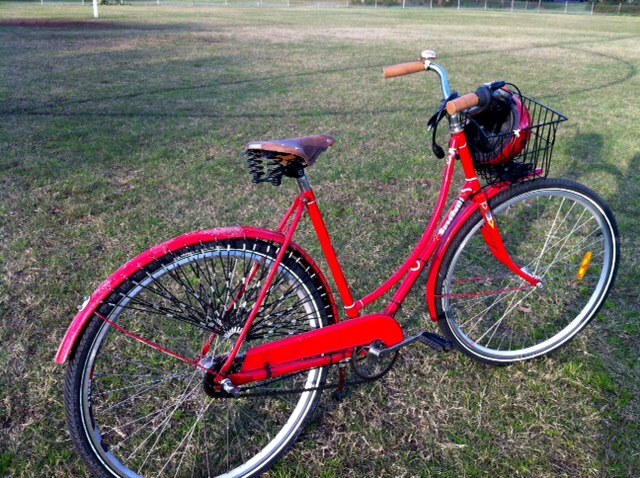 I don’t feel the three speeds are really necessary for the riding I do and the addition of the adjustment window at the side of the rear axle means that I cannot fit a rack the way it was meant to be fitted on a bike of this vintage (the bike has no braze ons for a rack). Also, the clicking sound which is inherent in the hub, annoyed me when I first had it fitted, and though I am no longer as aware of it, it is still a factor working against the hub. I have since ridden new bikes with the same hub fitted and it feels quite different, more solid is the best way to describe it. Retrofitting this system to an old bike does not seem to work quite as well. I also don’t like the additional cable that is necessary and the modern style plastic shifter does not look right on the bike. I have been told that I could source an older style trigger shifter but I am reluctant to tamper with a system that is, for now at least, working. The presence of the adjustment window on the side of the bike also means that I cannot fit a device that allows for easy adjustment of the chain, so when the chain becomes loose and the wheel needs to be moved back in the dropouts, which happens every few months, I have to take it to a bike shop to have this done. The back pedal brake, also a part of the hub and the most pressing reason I decided to have new wheels fitted, works very well and can cause the rear wheel to lock if applied with force. I like the options of both pedal and hand operated brakes too. The modern wheels, although I don’t really love the look of them, I can’t fault for performance. They enable me to ride over rocky ground and down gutters if I need to, without any problems. They have also enabled me to have a front brake fitted. This brake would not have worked on the old painted rims I had before. I feel much safer on the bike since having this additional brake fitted as the chain has fallen off a few times, though never on the downhill, always on the flat when I am in too high a gear. I am very happy with the front retro style basket and the skirtguard. They are very similar to the originals that were on the bike when I was a child and they work well and look appropriate. Having said all this, the Speedwell is very functional as a city bike and, with the addition of a small backpack and the bag on the saddle, it meets my carrying requirements most of the time and everything works well on it. Restoring an old bike is always going to be a constant trade off between functionality, comfort and staying true to the origins of the bike. I feel that I have achieved the best outcomes for me without trading off too much, though whenever I talk to Peter about it, we end up talking through options which ultimately have drawbacks in terms of some of the above aspects. He still has the beautiful old hub, which he has restored but which still awaits being laced into a new wheel to see if the brake now works. So the old parts are still being used in a restoration project, always a good thing! 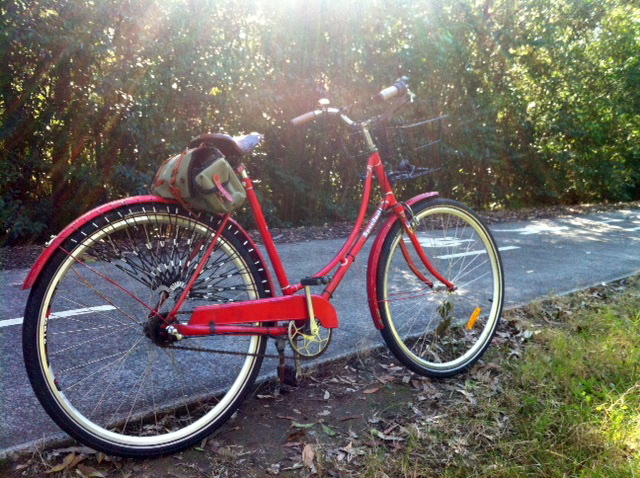 This entry was posted in Uncategorized and tagged old bike, review, shim, Shimano nexus 3 speed, speedwell, vintage bike. Bookmark the permalink. There is an adjusting bolt under the saddle nose Vicki, and by this time it probably needs a little tightening with the spanner that came with the saddle to stop it going banana shaped with use. A big problem with old bikes and new wheels are the dropout widths. I feel that many of your ‘practical’ setbacks with the Nexus 3C have come from the fact that they are 120mm wide hubs and have to be shoe-horned into 110mm frames. That bellcrank is very obtrusive ! An older 110mm 3-speed Shimano 3S or Sturmey 3SC would fit better, but they are so rarely found here with coaster brakes and a rear handbrake isn’t going to work either ( skirt guard, etc. ). Your old Speedwell Renak hub has 40 spoke holes so it suits very few rims and probably still won’t stop all that well – it’s better to go to a sharp-stopping, modern made 110mm x 36 hole coaster hub and fit it to an appropriate rim that looks a bit more traditional. 700C rims like your new ones have the widest range of tyre sizes, also with the reflective stripe that you like. All this has caused me to learn how to build wheels, to try and get around these sorts of issues myself. So true what you say about the compromises between style and function ! If you’re really keen to go back to a single speed coaster, we should have a chat about options. P.S. I will be posting a Nexus 3C conversion to a 1984 derailleur frameset soon (if it works ! ). Peter, thanks for the input, we can talk soon. I am late to this party as I havent been notified of comments on the blog for nearly a week, not sure why, so please everyone excuse my late replies to this post. And thanks for the tip re the saddle, I’ll take a look at it, though it is very comfortable now! 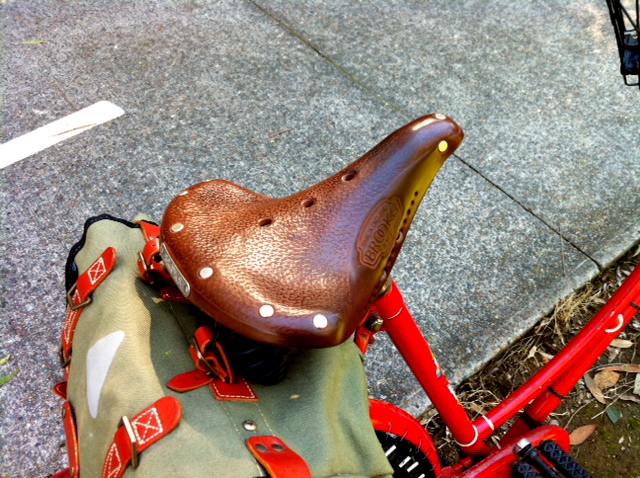 The saddle leather colour has aged quite uniquely Vicki. Thanks Peter! I got this comment so it’s working again now. The other big problem you’ve noticed with the Nexus 3C is the lack of axle space between the large bellcrank and the wheel nut which hardly allows the fitting of the old style ‘over the axle’ racks and looped mudguard stay ends. A longer axle might have solve the problem but would leave the bellcrank much more vulnerable to knocks. New bikes from the 70s on nearly all use the little separate eyelets for racks and guards and don’t need the axle space. The older geared hubs were sometimes fitted to the plain pressed dropout ends that our 60s and older Speedwell frames have, and their design did allow these accessories to be fitted. I hope our experiences at least help any readers who may be attempting such a conversion ! I’ve found a special rear rack for bikes without brazed-on eyelets. Laurent, I have an old rack I want to mount on it. I should have gotten a hub with the brakes and not the gears as the bike rode beautifully as a single speed. Thanks for the update. i only know too well the tribulations of older bikes, but yours is an ancient beauty, one worth preserving and updating, because it means it gets ridden. I smile every time you post a picture.